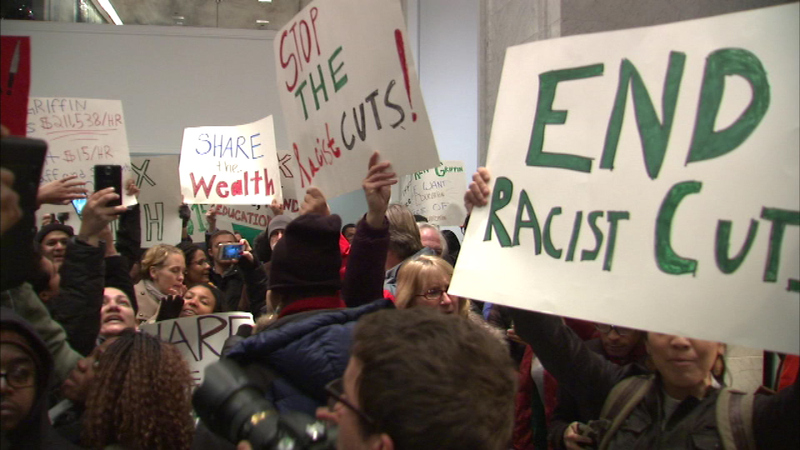 CHICAGO (WLS) -- Hundreds of students rallied at the Waldorf Astoria where billionaire Ken Griffin lives, calling for an end to our state's budget crisis. Griffin is a University of Chicago trustee and also Governor Bruce Rauner's biggest donor. The protesters called on Griffin to use his influence to push for a progressive tax in Illinois. Many Illinois workers are also making their own demands as the budget stalemate continues. Members of public service unions and community groups gathered in a "Rally for Fairness" on Chicago's West Side this weekend. It was first of seven rallies planned this week throughout the state. Organizers are calling on Rauner to solve the state's budget crisis without restricting the power of unions. Rauner argues that union reforms are needed to spur economic growth in the state. The Illinois Senate convenes Monday to consider a partial compromise budget bill that will free up some funding for local governments.